Room Assigned at Check-in - Sleeps Two Adults - 1 bed requested. Room Assigned at Check-in - Sleeps Two Adults - 2 beds requested. 부에노스아이레스에서 여행하기 편리한 호텔을 찾고 계신다면 Ayres de Recoleta Plaza 만큼 좋은 곳이 없습니다. 이곳에서 생생한 도시의 모든것을 쉽게 즐기실 수 있습니다. 이그레시아 드 누에스트라 세뇨라 델 필라, 무세오 파티시바티보 드 시엔시아스, 라 리콜레타 세메터리에 근접하고 친환경 호텔에서 특별한 편안함을 맛보실 수 있습니다. Ayres de Recoleta Plaza의 모든 노력이 손님의 기분을 편한하게 만들기 위해 호텔은 최고의 서비스와 시설을 제공합니다. 호텔의 손님들은 내부에 있는 전 객실 무료 와이파이, 24시간 프런트 데스크, 여행 가방 보관, 비즈니스센터, 세탁 서비스 같은 시설을 즐기실 수 있습니다. 또한, 모든 객실은 편안하고 안락하게 꾸며져 있습니다. 대부분의 객실에서는 고객님의 편안함을 더하기 위해 에어컨, 난방, 발코니/테라스, 전화기, TV 등의 편의 시설을 제공해 드립니다. 호텔에서 지내는 동안 레크레이션 시설 등 풍부한 시설을 이용하실 수 있습니다. Ayres de Recoleta Plaza 숙박시설은 부에노스아이레스에서 편안하고 매력적인 곳을 찾는 여행객들에게 이상적인 장소입니다. a bit expensive for the type of service given: no restaurant, small breakfast served in the room. One wall had a huge stain of I don't want to know what it is. Small bathroom. It looks like much better on the pictures. Location is great 100meters from Recoleta cementery. The hotel is located close to the cementary which is a top tourist attraction in Buenos Aires and have a few restaurants/bars as well as grocery stores in the area so it is very convenient. The atmosphere area is more relax than downtown and you can see many people chilling out in the park. 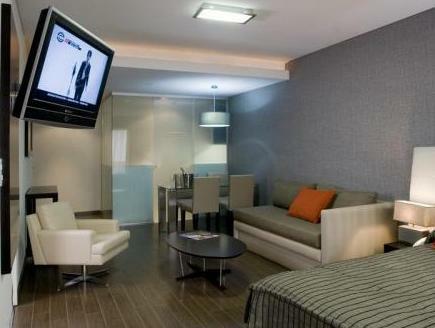 The room is good size and comfortable, although nothing fancy or luxurious. There are 2 computers in the lobby with internet access so sometimes you have to wait. Breakfast they bring to your room when you call housekeeping, it is basic but adequate. Very friendly staff. 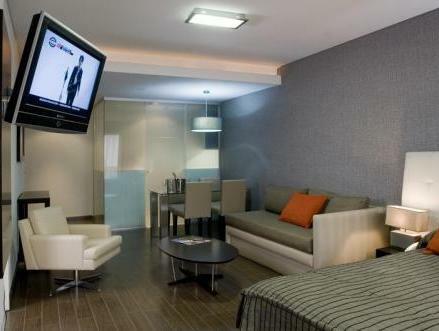 The Hotel location is awsome nearest of good restaurants, luxury shopping and great plazas. In the "heart" of Recoleta. The room size is great and clean. Perfect ubication in Recoleta, peaceful, clean. Not a place to meet people; very small swimming pool. This hotel is a perfect place for a traveller (business or pleasure) who wants a room with space (couch, breakfast table with four chairs, little kitchen). WiFi is available in the room (against a small fee) and free use of PC's are in the hall way. 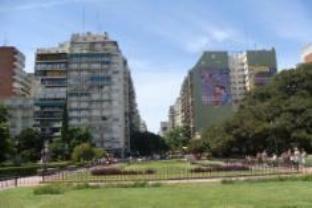 It is positioned at the corner of Recoleta Park with many bars and restaurants. Staff is kind and helpful. Everything is very clean. Breakfast is served in the room. This means that you do not get to meet many people in the hotel. All in all a very good place to stay. o corredor e apartamento não estava cheirando muito bem. hotel bem localizado,próximo a cafés, parrillas e gelaterias, com fácil locomoção para atrações da recoleta. apartamentos claros, com bom gosto, tv de lcd, mesa para refeições e uma pequena cozinha.boa relação custo-benefício para sua hospedagem em buenos ayres hotel com lounge elegante, com pequena piscina na parte térrea para seu conforto em dias mais quentes. prima plaats om recoleta te bezoeken. centrum is wat verder weg, maar snel en zeer goedkoop bereikbaar per taxi, waarvan er veel voor de deur staan.